The iOS App Store was the first mobile app store to enable developers to sell their creations to end users directly and without any hassle. It was so new and exciting that in 2008 developing for iOS was a lot like digging for gold in California in the mid 1800’s. Things have changed a lot since. Fast forward six years and we now have three major app stores with more than 500,000 app developers out there. With so many stores developers can sell apps on, we wanted to take a look at which store developers like most and, whether they show their loyalty or sell on all of them. For the purpose of this post a developer is an entity (person or company) that’s currently selling one or more mobile apps on the iOS App Store, Google Play, or the Amazon Appstore. Google Play is clearly leading the charge with 292,796 developers. Close behind is the iOS App Store with 271,509 developers. The Amazon Appstore seems to be a distant third, with nearly a tenth of it’s competition: 31,247 developers. The results were a bit surprising. While about 12% of developers sell on two or more app stores only 1% sell their apps in all three. Going into this we didn’t expect this to be a high number, but 1% is considerably lower than what our gut said. Whether it’s a technological barrier or just plain loyalty, developers seem to stay on their side of the fence more often than not. Now, if you’re saying in your head that the numbers are grossly skewed by the small developer community on Amazon you’re probably right. 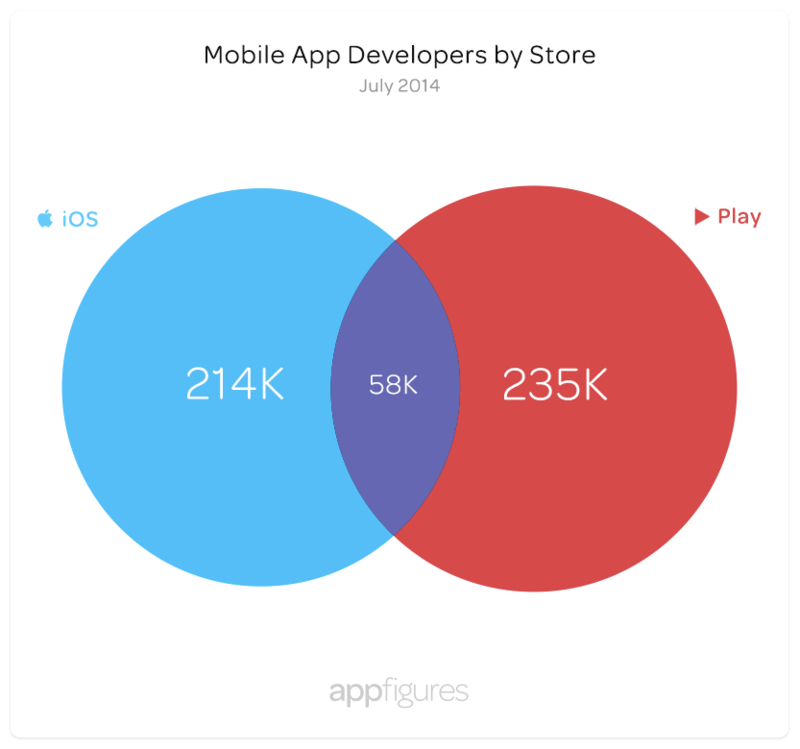 Let’s take it out and examine the overlap between the iOS App Store and Google Play. Removing Amazon certainly changes the picture. When just comparing the two biggest stores, with a total of 506,742 developers, the overlap grows to roughly 11%, or 57,563 developers. A much more respectable number, still a strong indication that developers prefer to stick with one store. Both Google Play and the Amazon Appstore share the same platform, Android. This means that many apps developed for Google Play can actually be sold as-is on the Amazon Appstore. Given this technical shortcut, we expect there to be a far greater overlap between the two stores. But there isn’t. With roughly 5.5% overlap (17,354 developers), this does not seem to be the case. Looking at it from Amazon’s perspective however the story is very different. 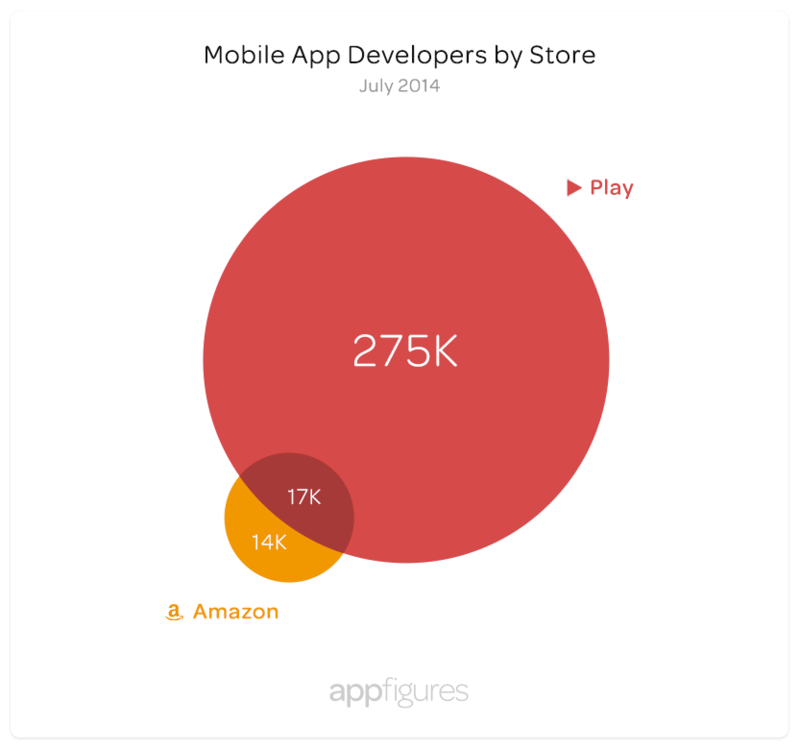 Nearly 55% of amazon developers also sell their apps on Google Play. That’s a pretty big difference in comparison. Over the years the iOS App Store and Google Play have grown and amassed more than 500,000 developers between them. Most developers sell their apps in one store only. Google Play has the most developers. Amazon Appstore has the least. 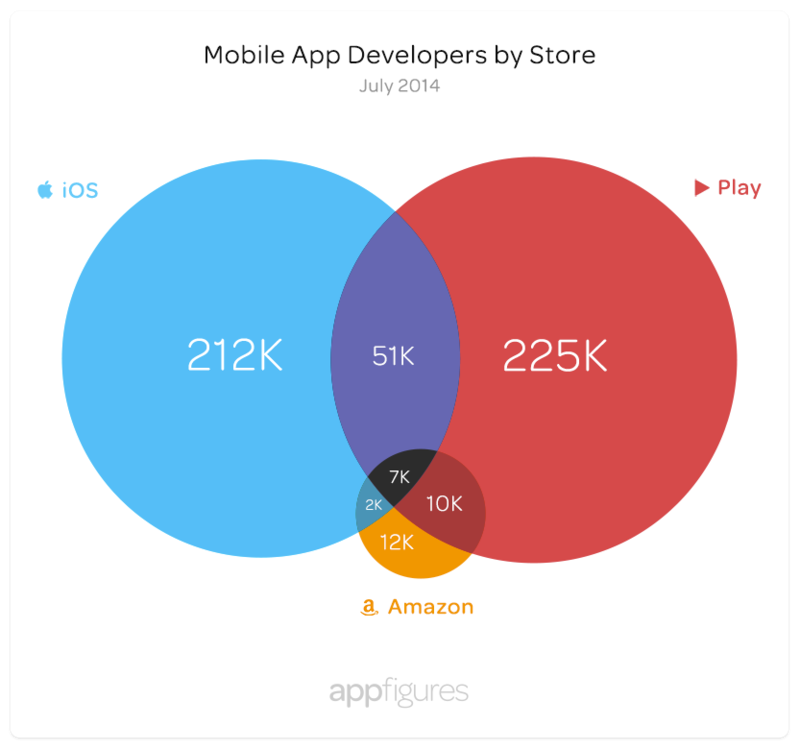 ~1% of all app developers sell apps on all three stores. ~11% of developers sell on both iOS and Google Play. 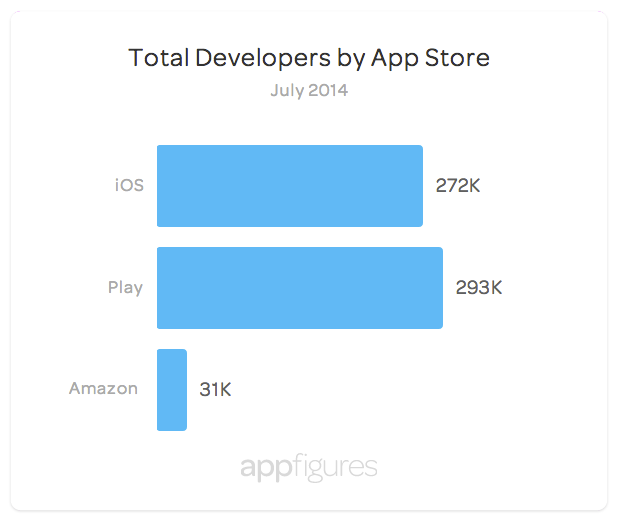 ~12% of developers sell on two or more app stores. Determining the overlap required a bit more work. Since the names developers use to identify themselves in different stores is not always the same we needed to normalize those names so they can be matched. Normalization won’t catch names that are considerably different (“Adobe” vs. “Adobe Systems”) but it gets us as close as we can get to the real numbers. We normalized names by removing all punctuation (!,”, etc. ), spaces, and common business entity abbreviations (llc, ltd, gmbh, etc.). We then compared the results across different stores using a case-insensitive matching. We hand-verified a random sample of 11,000 developers to ensure the normalization doesn’t result in too many false positives. The error rate we observed was minimal. Like this Data Bit? Subscribe to our RSS feed or follow us on Twitter or Facebook to get new app store insights. We’ll be exploring the Windows stores (Phone and desktop) in a future follow-up post. The numbers on your charts don’t make any sense – how can the number of developers who only develop for a single store change between the charts? The totals per store aren’t changing between charts but the overlap is. The charts are confusing. They should be reworked a bit to be clearer. Thanks for the feedback Chris!